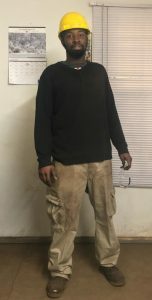 Terry, from Walterboro, SC, graduated from the Professional Welder program at the Tulsa Welding School, Jacksonville campus, in February 2018. Thanks for your time, Terry. What did you do before enrolling at Tulsa? I went into the Army for a couple of years straight out of high school. I served as an information technology specialist. When I got out, I went to college to study the same thing for an Associate’s Degree. But during college, I realized I didn’t want to do it anymore. It was the same thing over and over every day; it was boring. I could go back to it, but it’s not something I want to pursue. So what made you choose welding school? I didn’t really enjoy the military or college, so I didn’t know what I wanted to do. In May last year, my younger cousin told me he was going to welding School after high school. He asked if I wanted to go with him. He told me about this welding school down in Jacksonville, the number one welding school in the nation. I’d done welding for three years in high school, so I knew the concept of it. I liked it in high school, so I thought I had nothing to lose at that point. I signed up at the last minute and started June 23. It was different every day—a different task, a different problem to solve. The way I learned was to take information from different instructors and put it together to find my own unique way. I got knowledge from each of them; I didn’t just talk to one instructor, I talked with all of them. They are there to help me get to their level, so in order for me to be able to do that, I had to pick their brains. That’s how I approach everything in life: I talk to people to get different perspectives. It was a combination of the instructors and the hands-on time. The hands-on time was great because you’re actually doing it; you’re not in a classroom all day. You’re not learning how to weld from a book. Then you have the instructors pointing you in the right direction, so the two go together hand in hand. I’m working at Allstate Steel Company in Jacksonville, FL. I started a few days after graduation. Ms. Shuntae Lee [in Career Services] pointed me in the direction of this company on the Monday after I graduated. I did the application, took a weld test on Tuesday and started work on Wednesday. The first job I went for paid $25 an hour with a $110 per-diem. I was upset I didn’t get that one, but I didn’t let that stop me from pursuing what I wanted to do. This job is $17 an hour plus overtime, which is fine for me right now. Sometimes you have to settle to get a job in the field you want to be in. I need to build my experience and skills to the point where I’m worth more. A lot of people go straight for the top dollar jobs, but if you’re fresh out of school, you’re not going to get those jobs without experience. Sometimes you’ve got to learn to settle and have patience. Did you do anything exciting with your first welding paycheck? Paid bills! I’m getting old. I’ve got responsibilities. I’ve got to pay rent, make a car payment and everything else! But at the same time, my checks are enough to cover me every week and have money on the side. I don’t need anything right now, so there’s no need to spend extra money. I work five or six days a week. I might go out to eat, but mostly I just work and come home. That’s all I do. My mother always taught me to set something aside for a rainy day. What do you like about being a welder? I like that it doesn’t matter who you are or where you come from; if you can’t pass the weld test, then you don’t meet the qualifications of the job. I can go anywhere in the world, pass a weld test and pass a background check/drug test, and then I’m working. It’s not hard to find work; there are so many opportunities in this field. You’ll always find some type of work somewhere because we’ll always need metal. I also like making something out of nothing. Being able to look at buildings and say I helped build that. I enjoy being able to see the results of my work. No-one can take that from me. I just did an application for the union – United Association, the UA Local 234 Plumbers & Pipefitters. I feel that working for a union is the best option for me for the rest of my life. I say that because I’ll be 25 in June. I don’t have a wife, girlfriend or any kids. Being in the union will help me better prepare for a family when that time comes. They have good health insurance. I’ll always be working. If I’m out of work, they’ll find work for me, and it reminds me a little of the military because everyone has your back. I think it will be a good fit for me. If I can do 30 years in the union, after the five-year apprenticeship, I’ll be almost 60 and be able to retire at a decent age with a decent pension. The money where I’m at now is good, but I always want more. After a five-year apprenticeship, I could be getting those $32 an hour jobs. I could travel, or I could stay in one place. I’d just have so many options. If you’re going to do it, do it for real. Don’t play around. Take it seriously. Nothing is going to be given to you. You have to earn it. You’ve got an opportunity to do something good with your life, so take that opportunity now while you have people willing to help you. Be willing to take advice and ask questions.